Since the mass shooting in Parkland, Fla., the MSM, liberals and gun control organizations have elevated the "children," to speak on their behalf, holding them like shields, hiding behind them, by claiming anyone that corrects the cornucopia of misinformation they continuously spew, or challenges their fact-free assertions are "attacking" a child survivor (cue the crocodile tears), while these teenagers continuously attack millions of law-abiding gun owners across America. While the National Rifle Association (NRA), who has been the target of these youngsters ire, calling them and their millions of members murderers and baby-killers, has seen a massive spike in membership with over half a million new members, and has seen their donations tripled, from nearly $250,000 in January to over $779,000 in February, other gun rights groups are seeing similar spikes in membership. The NRA may be the most well known gun advocacy and second amendment supporting groups, but other lesser known gun rights group are reporting spikes in their membership as well, increasing in direct relation to the loud calls to ban certain weapons and to violate Americans' right to bear arms. Second Amendment Foundation is reporting a "1,200 percent increase in the number of 18- to 20-year-olds joining or supporting the organization," as a direct result in "efforts to restrict firearms ownership by young adults," following the Marjory Stoneman Douglas High School shooting. Via TIME we see that Georgia Gun Owners, with a modest membership of 13,000 increased by 1,000 members in the course of a two week period, while National Association for Gun Rights, which touts 4.5 million "members and supporters," saw a 30 percent increase in online membership applications. 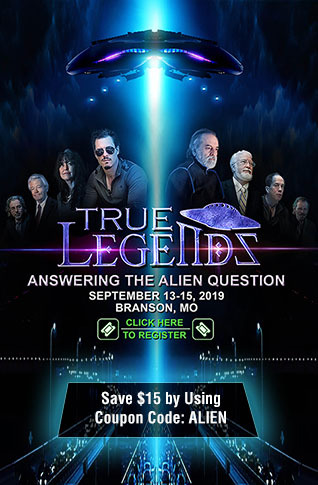 The Connecticut Citizens Defense League, with 29,000 members, has seen increased interest from the typical 15 or 20 applications a week to almost 200 in a one week period. Gun Owners of America with 1.5 million members saw hundreds of new members in a one week time frame. The group grew by "thousands" when gun grabbers pushed for more gun control after the Vegas shooting in October. The constant push by gun-grabbers, especially how the media is focusing on the younger crowd, while admitting they aren't bothering to correct their false assertions and inaccurate, misleading information, as CNN's Brian Stelter admitted to letting David Hogg get away with lying on his show, has brought abut a bit of backlash, while the gun control movement is creating an intense increase of interest in buying AR-15's (The gun these kids are blaming instead of the person that allegely fired the weapon), and in joining groups like the NRA. 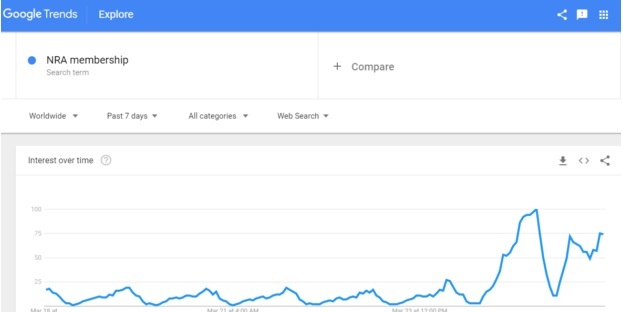 During the March for our lives event, Google searches for the keyword term "buy AR-15," hit its biggest peak since shortly after last month's shooting, spiking again two days later as the media provided wall to wall anti-gun coverage. 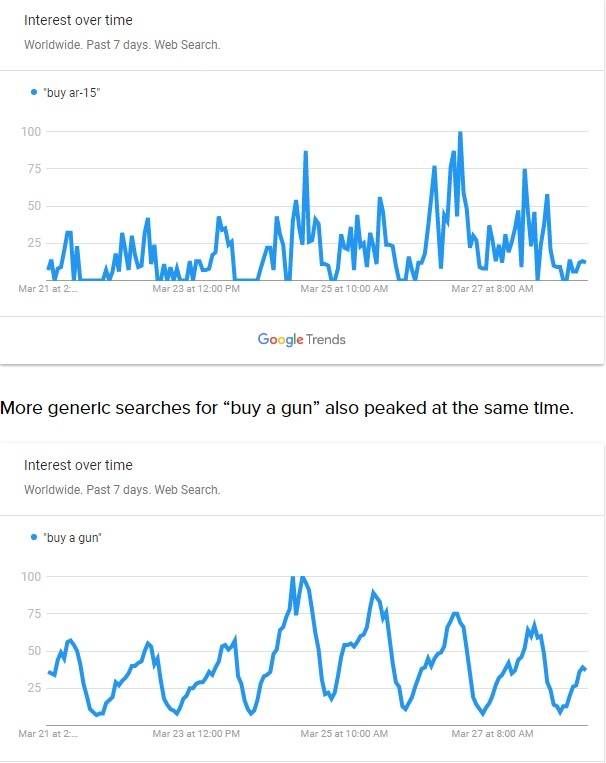 The search term "buy a gun," also spiked during the anti-gun march. The numbers on the left of the chart, according to Google, "represent search interest relative to the highest point on the chart for the given region and time. A value of 100 is the peak popularity for the term. A value of 50 means that the term is half as popular. A score of 0 means there was not enough data for this term." During the same event and time frame, searches for "NRA Membership," peaked to 100 as well. While liberal rags are busy creating fictional weapons to ban, just to have to correct their articles later, and CNN is admitting to not correcting misinformation, tone deaf liberals are proposing "ammunition" control, as the disgraced former DNC chairwoman Debbie Wasserman-Schultz is proposing background checks for ammo buyers, and other Democratic politicians encouraging the seizure of weapons, and pushing the idiotic proposal from former Supreme Court Justice John Paul Stevens to "repeal the second amendment," other liberal journalists who are starting to note how the hard push for gun control is backfiring and encouraging people like Stevens to please just shut up because they fear that "gun-owning, blue-collar workers" will get riled up before the 2018 midterms. WaPo reporter Aaron Blake’s analysis of Stevens’ position was a little more to the point. “[R]arely do we see such an unhelpful, untimely and fanciful idea as the one put forward by retired Supreme Court justice John Paul Stevens,” Blake wrote in a Tuesday analysis trashing the former justice’s position. “The move might as well be considered an in-kind contribution to the National Rifle Association, to Republicans’ efforts to keep the House and Senate in 2018, and to President Trump’s 2020 reelection bid,” Blake argued. Democrats and activists have been working night and day to push a battery of gun control legislation since a spate of February shootings. “This is exactly the kind of thing that motivates the right and signals to working-class swing voters that perhaps the Democratic Party and the political left doesn’t really get them. And to the extent it catches on — which it could somewhat, given nearly half the party is on board, at least in spirit — it will confirm plenty of preexisting beliefs about what Democrats actually want,” Blake added. 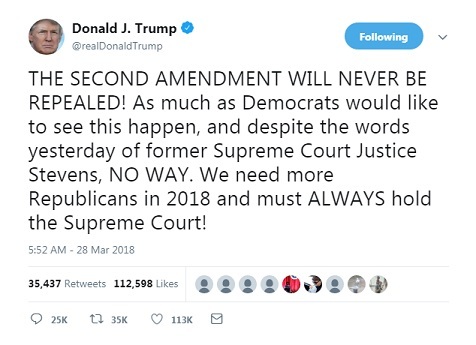 President Trump seemingly understands the same thing as he bluntly connects the two in response to Stevens' call for repealing the second amendment, stating, "THE SECOND AMENDMENT WILL NEVER BE REPEALED! As much as Democrats would like to see this happen, and despite the words yesterday of former Supreme Court Justice Stevens, NO WAY. We need more Republicans in 2018 and must ALWAYS hold the Supreme Court!" Historically liberals have used tragic events like mass shootings to go after weapons and the second amendment rather than accurately pointing out the failures, which there were many regarding the Florida shooting, of law enforcement and the FBI by not enforcing the laws already on the books, to prevent the Florida shooting, but this time they decided to use traumatized children to push their agenda, which has caused an increased push back by second amendment supporters. While the media highlights youngsters like Hogg and others, they are also inadvertently spotlighting their ignorance of laws, the constitution, and their inability to understand "cause and effect" where every time they push for banning weapons (action), millions of Americans start searching for where to buy those weapons (reaction). Every time they attack the tens of millions of law-abiding gun owners (action), second amendment supporters triple their donations to gun rights groups (reaction). Every time these youngsters spew out an incorrect fact, unchallenged by the media outlet interviewing them (action), millions of Americans start asking "why listen to them on gun control when they cannot even get their facts straight" (reaction)? Gun grabbers have overplayed their hand and while the media and liberals will elevate their voice, millions upon millions of Americans are speaking with their wallets, joining and donating to gun rights groups and obtaining more weapons, not in spite of the gun control push, but because of it. 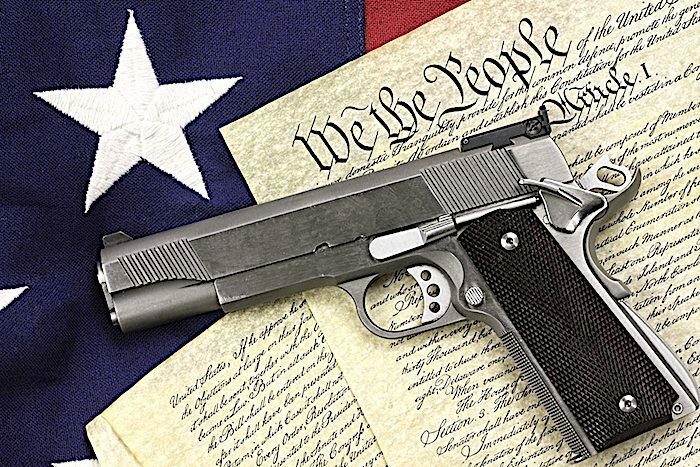 Thanks to liberals and media, hiding behind children in order to violate the constitutional rights of Americans, there are now more law-abiding gun owners, more NRA members, more members in other gun rights groups, and more money being donated to help those groups help fight for our constitutional rights. That ladies and gentlemen is cause and effect.